Nearly $20 million dollars is budgeted for at least seven construction projects at IU South Bend over the next two to three years. Leading the way is the $3.6 million renovation of the first floor of the Administration Building. The first floor has been almost completely vacated in recent months in preparation for a transformation from a traditional administration building into a hub for student services. Additional funds for furniture and to replace all the glass windows in the Administration Building add nearly $2 million more to the construction budget. 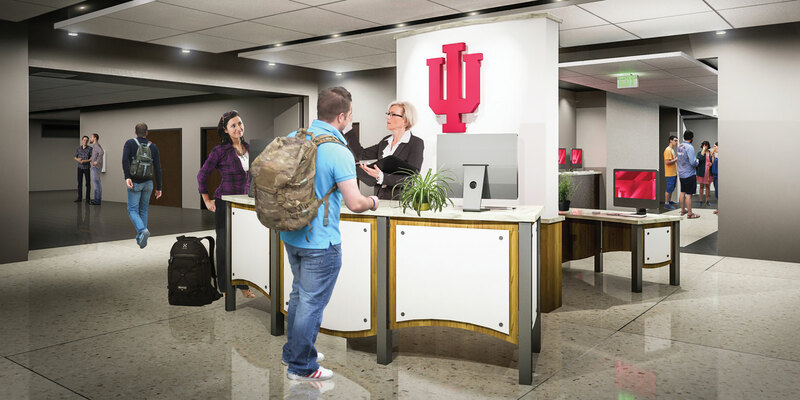 When the project is completed, all of the offices and people who support students from when they start at IU South Bend to when the graduate will be together. Those offices include Student Services, Admissions, International Student Services, Financial Aid, Registrar, Bursar, Human Resources, Career Services, Alumni Affairs, Counseling, Disability Support Services, Special Events, Dining Services, Making the Academic Connection, Academic Center for Excellence, Titan Success Center and more. Architects studied adjacencies and designed the area to have the right people next to each other to be more effective, efficient, and convenient for students. The design will feature open space and use of natural light. Construction is scheduled to begin this summer and the project is expected to be completed in time for the start of classes in fall 2017. Nearly $4 million is planned for the renovation of Riverside Hall into the new home of the IU South Bend Health and Wellness Clinic, along with a Center for Health Education. In conjunction with HealthLinc, IU South Bend will be expanding its healthcare and dental services to the community. Healthlinc is a Federally Qualified Health Center and received a $1 million grant to provide services on campus. The project is also supported by a $1 million donation that was part of a charitable trust gift of $5.85 million that named the Vera Z. Dwyer College of Health Sciences at IU South Bend. Northside Hall, the oldest building on campus, is getting $4 million in exterior work done this year which will be followed by another $6 million budgeted by the state for further heating, cooling and other structural improvements. Other projects include a new roof for the University Center, plans for a Sustainability Showcase that will promote environmental best practices for the campus and the community, completing a sculpture house for some fine arts programs on Lincolnway West, and expansion of health sciences programs to the IU South Bend Elkhart Center.